Okay, so you just have to love my nieces. This recipe comes verbatim from my niece Joanne. I couldn't change a word of it. It's all about who she is...her wit, her "whatever" attitude, her originality, her ability to have fun with whatever she's doing. She always puts a smile on my face. 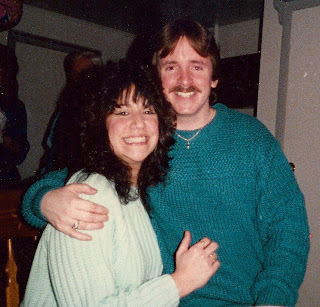 This picture of Joanne and her husband Jimmy was taken on St. Paddy's Day at our home in Canarsie, Brooklyn a wee bit ago. Prepare pudding according to directions on box, using slightly less milk to make a thick pudding. Add in the cool whip and fruit, then add in handfuls of mini marshmallows. Chill for an hour or two. Sprinkle coconut on top when serving. You can change this up any way you like. You can use any flavor pudding, any kind of fruit, you can add as much or as little of the mini mallows as you want, depending on how sweet you like it. You can leave out the coconut. Use bananas and chocolate pudding, vanilla pudding and peaches....whatever you like! I like the pistachio cause it's different (and hard to spell). I have a recipe somewhere for real ambrosia (with sour cream) which is also easy to make.